Patricia Smith started at the Brattleboro Reformer in the fall of 1969. The longtime staffer was laid off last Friday. 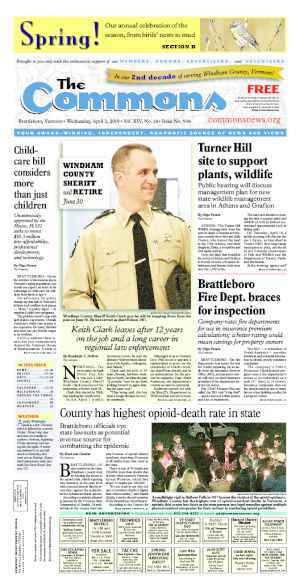 BRATTLEBORO—The parent company of the Brattleboro Reformer has laid off two members of its editorial team, including the longest serving member of its staff. According to sources within the company who spoke on condition of anonymity, New England Newspapers Inc. (NENI), a subsidiary of Digital First Media (DFM), laid off multiple employees on Friday and Monday at the Reformer, at its two other dailies, the Bennington Banner and The Berkshire Eagle, and at the Manchester Journal, a weekly. Let go in Brattleboro were Lead Reporter Mike Faher and News Clerk Patricia Smith. According to Matt DeRienzo, who worked as Northeast regional editor for Digital First until last October, the layoffs seem to be taking place across the company’s portfolio of newspapers. The company has been shedding employees in recent months as it was preparing for a sale that since fell through. DeRienzo said he had to abandon an open newsroom project he was implementing in New Haven at the Register, and to cut half the newsroom staff of the Register Citizen in Torrington, Conn.
“I stayed to carry that out, and then I put my name last on the list,” he said. Smith started at the Reformer in September 1969 in the paper’s composing room. Aside from five weeks off in 1971 for the birth of her first child, and a break from 1974 to 1980 to be a stay-at-home mom, she has worked at the paper for four decades in a variety of roles, including proofreader and typist. By the end of her career, Smith served as the editor of the Religion and People pages as well as being the chief conduit for the community items that flowed into the newsroom on Black Mountain Road. The biggest change for Smith was the announcement earlier this year that the Reformer Christmas Stocking would make its final distribution of winter clothes for needy youngsters this November and then disband, ending a nearly 80-year holiday tradition. Faher covered state politics, the courts, and municipal news for Vernon, Guilford, Dummerston, Newfane, and Townshend. He had been with the paper for three years. With the layoff of Faher, and the transfer of another reporter, Chris Mays, to the Banner staff, the Reformer is left with just two reporters, Howard Weiss-Tisman and Dominic Poli. The former editor of the Reformer, Tom D’Errico, was also a layoff casualty. D’Errico became the editor of the paper in 2007, succeeding Sabina Haskell. In January 2015, he was named to the newly created position of content marketing manger for NENI. 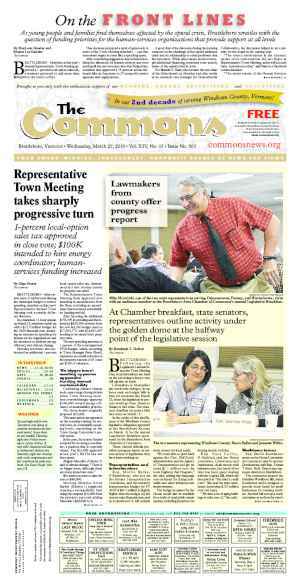 Michelle Karas, managing editor at the Banner, took over leadership of the Reformer newsroom upon D’Errico’s promotion. She ran both newsrooms until she resigned in June to take another position at the Colorado Springs Gazette. Her job will not be filled. A news clerk and a newly hired reporter, Jacob Colone, were also laid off at the Banner. The Manchester Journal lost its lone reporter, Brandon Canevari. No formal announcement about the layoffs was made by NENI. Its CEO and regional president, Edward Woods, and vice president, Kevin Moran, did not respond immediately to emails requesting comment on Tuesday. The news of the NENI layoffs came amid uncertainty over the future direction of Digital First Media (DFM). DFM was formed in 2011 when MediaNews Group (MNG), which bought the Reformer in 1995, joined the Journal Register Company (JRC). The goal was to transform the two newspaper companies into one online media company. MNG — founded by Dean Singleton and the late Richard Scudder in 1983 — was one of the largest media companies in the United States, with 57 daily newspapers and a empire that stretched from Massachusetts to California. It ran into financial troubles and filed for Chapter 11 bankruptcy in 2010. It emerged from bankruptcy with a sizable chunk of its stock held by Alden Global Capital, a hedge fund group. JRC, which owned 19 daily newspapers and more than 150 non-dailies, also filed for bankruptcy in 2009 and 2012 and also ended up with a sizable chunk of its stock owned by Alden. Digital First had modest success with increased online ad revenues, but the gains were not enough to offset plummeting losses in print advertising. The company announced last year that it was up for sale and was close to a deal with the buyout firm Apollo Global Management to sell most of its assets for about $400 million. That deal fell through in May. Since then, DFM has been selling its holdings piecemeal, starting with the sale of 10 newspapers in Pennsylvania, Texas, and New Mexico to Gannett. Its CEO, John Paton, also stepped down. DFM has also been selling its real estate holdings. The Reformer’s plant on Black Mountain Road has been for sale for more than a year. The asking price for the 22,000-square foot building is $850,000. The plant, which was built in 1981 and expanded in the late 1990s, is largely dormant. The Reformer is now printed in Pittsfield, Mass., at The Berkshire Eagle. Two other DFM papers in New York, the Troy Record and The Saratogian, announced on June 26 that the papers eliminated 11 editorial positions through voluntary buyouts and layoffs. DeRienzo, who now serves as interim executive director of Local Independent Online News Publishers, a nonprofit industry group for local news websites, had been in charge of implementing new protocols in the DFM newsrooms with a fresh emphasis on social media and video. In 2012, he represented the Reformer in a panel discussion at the Slow Living Summit in Brattleboro on the future of community journalism, where he spoke about a company-wide initiative to train reporters to deliver news more rapidly across multiple platforms. DeRienzo also described the company’s efforts in “grassroots news leadership” — to engage with the community, noting pilot projects at the Register Citizen, like opening the newsroom and editorial board meetings to the public. Those initiatives have been abandoned, and — like DeRienzo — many of the people to carry them out no longer work for the company. 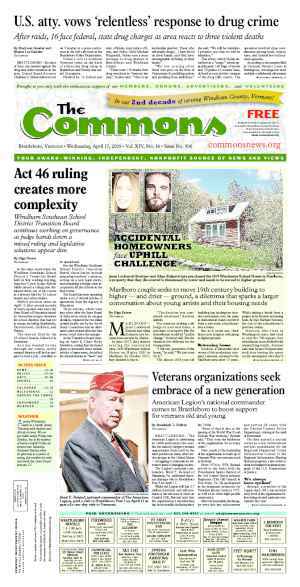 “That strategy didn’t stand a chance with the structure of ownership,” he said, noting that the goals of reimagining media properties like the Brattleboro Reformer required the mindset and creativity of a tech start-up culture. The bigger picture, he says, is the cumulative effect of multiple rounds of layoffs and buyouts on the journalism provided by community newspapers like the Reformer. On June 28, DeRienzo addressed that point on his blog (mattderienzo.wordpress.com): “Cuts in big newsrooms such as Denver, St. Louis and Chicago will continue to make news, but we don’t hear about the smaller local newsrooms who end up losing two of their remaining four reporters,” he wrote. “That’s why I hope community foundations and community leadership recognize journalism as worthy, as something to be funded, as a community-minded charity,” he said. 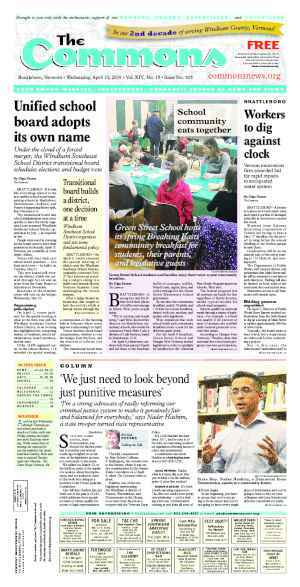 Originally published in The Commons issue #312 (Wednesday, July 1, 2015). This story appeared on page A1.